My wife gives him treats and yet the German Shepherd dog growls at her and now she is afraid of him. He has not been fixed. This has started about 2 weeks ago. Any reason why? 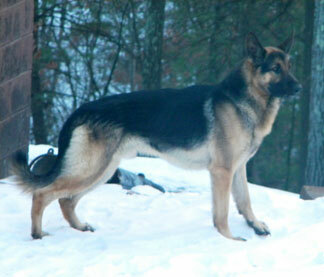 Comments for My 3 y/o German Shepherd has been very aggressive lately toward my wife - why? It could possibly be because the dog is not neutered. Males (and females) when they come into heat can become highly aggressive and territorial if not mated. Most dogs don't become aggressive, but some will. It would be best to have the dog neutered, reducing the problem of testicular cancer in the male dog and also because he won't be trying to get out and find a female to mate with, therefore producing unwanted puppies. Training with a professional would also help. Not the Petco kind, but a true professional. They are not as expensive as you think. They will help you with any and all questions and problems. I looked in the phone book in my area and found a place called "assertive K-9 training" class, it was every Saturday morning for two hours and was just the basics of working with a GSD. It worked wonders. Thank you for your help. That makes sense. your dog won't just leap with no warning. the best thing to do is correct it when said gsd stairs intensly. remind it that its not his job to protect you its your job to protect it. pin it down if needs be. I'm very anxious to know the answer to this question, also, as our 2-year old GSD is aggressive toward my husband at times. My husband feels badly about this. Undoubtedly, I have been the one to interact the most with her, as far as teaching things, feeding, sit, stay, running etc., but he takes her for rides and to do farm chores. Her aggression seems to occur particularly if I am sitting on a chair and my husband walks by too closely. She will leap right toward him. This has to stop, but I'm wondering if I'm going about it correctly, grabbing her by her collar to hold her and firmly telling her 'no'. What can he do? What can I do?